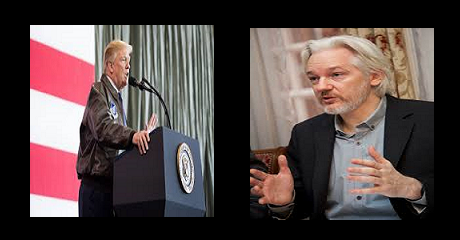 Today Julian Assange of Wikileaks was arrested in the U.K., and when President Donald Trump was inquired about it, he did not want to get involved, and some people were surprised because during the election of 2016, Mr. Donald Trump had favorably noted Assange's findings about Ms. Hilary Clinton who was the Democratic Party's presidential nominee in 2016. The reality is that President Trump won the election by winning the anti-establishment vote which in general does not necessarily belong to either one of the Republican or Democratic parties of the USA. In fact, Mr. Bernie Sanders, an independent, was a candidate for Democrats in the 2016 primary and attracted some of the anti-establishment votes but Ms. Clinton who became the final nominee of the Democratic Party was viewed by the voters as the establishment candidate. In fact, President Obama, just like President Trump, won his first election by attracting the anti-establishment votes, and some called it the Obama Revolution of 2008, but as time passed, President Obama became more and more identified with the establishment and actually in the case of Assange and Wikileaks, President Barack Obama took a real hard-line position and banned the US government news agencies from accessing Wikileaks' websites. The reality is that the United States has always had a significant number of people siding with anti-establishment views and they can be called anarchists but they do not necessarily consider themselves as such. For example the support of Tea Party (1) was very important for President Trump's success in 2016, nonetheless, in reality, it meant the success of US Republican Party which is basically conservative, whereas the views of Tea Party are very similar to the Libertarian Party of the USA and resonate with anti-establishment views. In short, in the political history of the West, anti-establishment ideas and anarchism in general, could not really bring any government which could be meaningful for their own ideals, because not just their ideals but the immediate goal of anrachism is the destruction of any government (2). It may also be interesting to note that the Left in the United States in 1960's and early 1970's during anti Vietnam War era was mostly anti-establishment and SDS the group which led the youth movement in those years was an anarchist group, but in the recent years, the Left has become more pro-establishment than the conservatives like President Trump, and just taking a look at CNN shows this reality. Thus even though some anti-establishment forces were not happy today with President Trump's response to the news of Assange's arrest, they may still vote for President Trump in 2020 because President Trump still supports more anti-establishment ideas than the left who have tried to distance Mr. Bernie Sanders from some of the anti-establishment views Mr. Sanders used to express in 2016.